We’ve seen our fair share of really sketchy tow truck situations here at Jalopnik, but it’s not everyday that folks get so frustrated with being towed that they just drive off into the sunset like they’re Superman levels of invincible. And I guess that’s especially true for one particular Russian fella driving someone else’s Kia Rio. This video is kind of incredible. 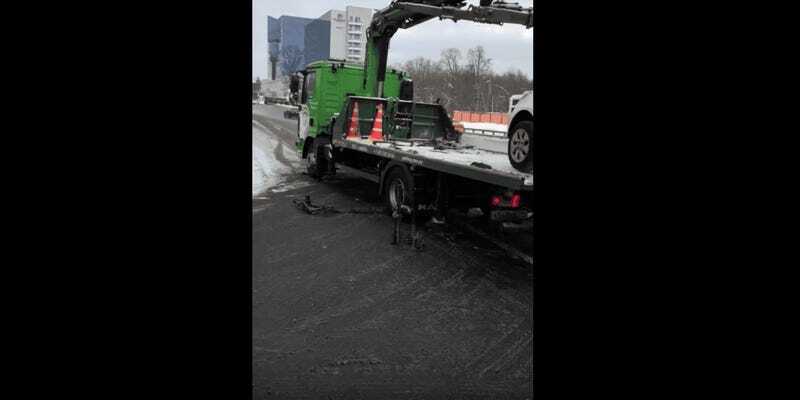 A Kia Rio was towed from the Vnukovo International Airport in Moscow because police officers had determined that the driver of the car wasn’t actually its owner. Despite the fact that the driver actually called the owner up on the phone (who had apparently just sold the car to the driver), the cops decided it wasn’t enough for them and called in a tow truck. And boy oh boy, does it get juicy. I have my own car service, I have experience and knowledge, and I calculated the trajectory—the exit from the tow truck could not damage either the tow truck or anyone nearby. As for the damage on my car, they are minor. I don’t know if I’d actually call that damage minor, but I mean, the Kia still ran. So, I guess that’s really all that matters.